Dubai is a city of superlatives, home to the world’s tallest building, its biggest mall, larger-than-life attractions, luxury resorts and much more. This fast-paced city, subject to constant reinvention, continues to attract global attention from tourists, businesses and investors who want to be part of its ongoing success story. Expatriates, who now account for more than 88 percent of the UAE’s population, have recognised the unique career and business opportunities the country offers, and so it is no surprise that destinations like Dubai are attracting some of the world’s wealthiest citizens. The 2017 Wealth Report by Knight Frank ranks Dubai 16th in a list of the top 20 most important cities globally for the ultra-wealthy. Dubai is the only city in the Middle East included in Knight Frank’s latest City Wealth Index, published as part of the consultancy’s annual Wealth Report. The UAE city ranks ahead of the traditionally wealthy Swiss cities of Zurich and Geneva, as well as Mumbai, Miami and Washington DC. The index ranks cities’ attractiveness to the uber-rich by analysing four measures: current wealth (the current population of UHNWIs in a city); investment (the total amount in US dollars of private investment into real estate in 2016); connectivity (the number of inbound and outbound first and business class flights in 2016), and future wealth (a forecast of each city’s UHNWI population in 2026). “Dubai’s strategic geographical location, modern and sophisticated infrastructure and business-friendly regulations make it a popular destination for people to live in, invest and grow their wealth,” says Dana Salbak, associate partner and head of MENA (Middle East and North Africa) research at Knight Frank. Meanwhile, the availability of higher quality investment stock, especially in the commercial and alternative (education and healthcare) sectors, is expected to drive further investment into the city, Salbak adds. 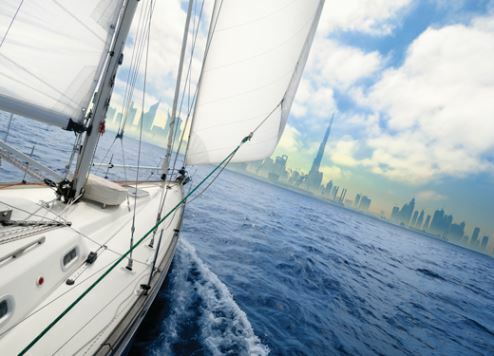 The Middle East’s ultra-wealthy population is forecast to grow by 39 percent over the next decade, according to Knight Frank’s report. The consultancy firm identifies the UAE as one of a “handful of countries” that enjoyed “significant” ultra-wealthy population growth during 2016. “What these countries share is the ability to attract migrating HNWIs and to offer a fiscal and political ‘safe-haven’, as well as excellent quality of life, which will be a recurring theme over the next decade,” the report states. Overall, London ranked top of the index as the most important city for UHNWIs, emerging ahead of New York with top scores for investment and connectivity. The Knight Frank report also identified neighbourhoods in key cities that are poised to excel in several categories. In Dubai, Salbak pinpointed Dubai South, citing its world-class infrastructure and transportation. “Set to become the emirate’s flagship urban project, Dubai South is a neighbourhood to watch,” she says. “Home to the Expo 2020 site, the area benefits from ongoing government spending on infrastructure projects, notably the expansion of Al Maktoum International Airport (DWC) and the Dubai Metro’s Red Line (Route 2020) which, once complete, will add to the potential for capital value growth in the location. Two of The First Group’s four upcoming hotel properties will be strategically located close to Dubai South. Millennium Place JVT Dubai, in the city’s vibrant Jumeirah Village Triangle (JVT) district, will add 599 rooms to Dubai’s hotel inventory when it opens in 2019, just in time for Expo 2020 Dubai the following year. In neighbouring precinct, Jumeirah Village Circle (JVC), the 496-room Ramada Plaza JVC will also leverage its prime location in New Dubai, close to the city’s major roads, biggest malls, DWC and the Expo 2020 site.